Taste test: These large triangular chips were guacamole green in color, with an uneven, bubbled surface. When I ate the first chip, it was good but had only the slightest guacamole taste. 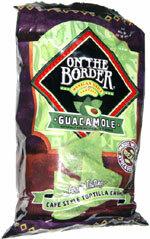 But the more chips I ate, the more authentic the guacamole flavor became, and then more I liked them. If you eat a whole bunch of these chips, you also get some decent heat to go along with the good guac flavor. Smell test: Pretty good, but not really a guacamole smell.